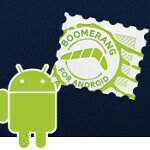 Boomerang is an extension for the desktop version of Gmail that has been made into an app for Android users. With the app you can schedule to have emails that were written earlier in the day sent out later. You can also search through your Gmail across various accounts and while composing a Gmail message, the app will use the contacts on your phone to auto-complete the email address of the recipient. You can even track the Gmail emails you send. There are numerous features on the app including the ability to use intuitive gestures for navigation and to snooze email messages by removing it from your inbox only to reappear at a scheduled date and time. And by swiping a message's title directly from the inbox, it can be starred, deleted, labeled and more without ever opening up the letter. That is similar to the swipe function on the latest update to Gmail, but with many more capabilities. Boomerang is a free download for those with Android 2.2 or higher and allows you to customize Gmail with different colors and themes. The app just was launched on Wednesday, so if you hurry and install it now, you could be the first on your block to have Boomerang make the jump from the desktop to your Android phone.